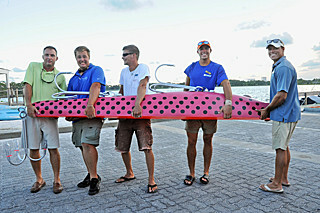 It takes five guys to hold the world's largest fishing lure. For this fishing lure, you’re going to need a bigger tackle box. You’ll need a bigger rod and reel, and a bigger boat, too. And heaven help you if you are able to troll this lure and actually hook a fish big enough to bite it. How big would a fish have to be to bite it? Big. Really big. Because the lure weighs 355.2 pounds and measures 10 feet, 10 inches. 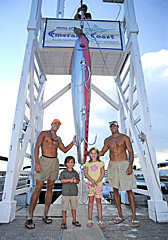 In fact, the lure is so big, it just became the world’s largest fishing lure officially on record. The Guinness World Records confirmed the record recently at the Sandestin Golf and Beach Resort in Sandestin, Fla.
Local fisherman/businessman David Partridge of Flat-Liner Lures designed the lure, which was constructed by employees and friends of S.S. Spitfire Mercantile. measures 10 feet, 10 inches. The reasons behind creating a large fishing lure were many. Firstly, it was a natural fit for the area. The Destin area is known as the 'world's luckiest fishing village' due to the quality and variety of the fish found in this section of the Gulf of Mexico. As such, it only makes sense that the world's luckiest fishing village would create the world's largest fishing lure. The International Game Fish Association keeps track of fishing world records, and now, Guinness Book of World Records keeps records for the world’s largest fishing lure. Since it was a new category, Guinness established a minimum requirement of 10 times the size of a standard lure. “The Sandestin lure was 24 times the size of a regular lure, so the only remaining detail was to take the exact measurements, as this is the yardstick by which future records will be measured,” Mochan wrote. After taking the measurements, Mochan declared the lure a world record. Alas, no fisherman will ever use the lure. It’ll be on permanent display at the S.S. Spitfire Mercantile, a fishing/souvenir shop at the marina of the Sandestin Golf and Beach Resort. Assuming there’s room. There are lots of online websites are available in the internet marketers who are sailing the equipment and gear for fishing, but there are only a few like this https://www.buyfishingguide.com/abu-garcia-pro-max/ which is sailing the best quality of fish hunting equipment and great on very reasonable prices. TideWe Bootfoot Chest Wader, 2-Ply Nylon/PVC Waterproof Fishing & HuntingWaders for Men and Women (Green and Brown) ... For a fishing enthusiast, this pair of steel toe fishing boot is a must buy. Free Shipping on many items across the worlds largest range of Fishing Boots& Shoes. Find the perfect Christmas gift best-workbootsguide for fishing enthusiast, this pair of steel toe fishing boot is a must buy.